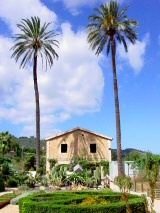 The Camp d'en Prohom and the land that surrounds this typical Soller house, house the Balearic Museum of Natural Science and the Botanical Garden of Sóller. The Balearic Museum of Natural Science was opened to the public in 1992. The ground floor houses a permanent exhibition dedicated to the history of natural science of the Balearics and on the first floor is the Sala Joan Bauzá, recently opened with the permanent exhibition, "Fòssils, un esguard al passat", that explains the geological history of the islands, via fossils. The Museum preserves different collections of fossils, rocks, fungi, insects and crustaceans amongst which the most outstanding are those of the nature experts from Soller, Guillem Colom Casasnovas and Joan Bauzá Rullan. The Botanical Garden of Sóller was also opened to the public in 1992 and its main objective is the preservation of the endemic species of the Balearics, the information and education with collections of living plants, and investigation in biology. The 13 collections of living plants that are in the garden are distributed in three sections: Balearic Flora, Flora of other Mediterranean islands, and Ethnobotany, that comprises ornamental and medicinal plants and fruit trees and vegetables particular to the Balearics.